Undisputed Sports Car Icon; Legendary Performance and Style. While awaiting the start of series production for his stunning, new “Hundred” roadster that debuted at Earls Court in 1952, Donald Healey commissioned a small batch of pre-production examples for the motor show circuit and high- profile racing events. Following an ill-fated Mille Miglia entry, where a broken throttle linkage forced a Healey’s early retirement, four cars were entered into the 1953 24 Hours of Le Mans. Quite mildly prepared and even retaining their stock bumpers and windscreens, two of them finished 12th and 14th overall – a stunning achievement in the face of a virtual armada of much more powerful competitors. In celebration of this sterling Le Mans debut, a small batch of 640 BN2-based 100 M models was factory-produced in 1955 and 1956. A rakish, reclining windscreen, and a louvered bonnet with Le Mans-regulation leather retaining strap visually distinguished these factory-produced cars, while mechanical upgrades included a high-lift camshaft, larger 1 3/4″ SU carburetors, high- compression pistons, a free-flowing intake manifold, a cold-air box, and a special distributor. As modified, engine output rose to 110 hp, and handling was noticeably sharpened with enlarged anti-roll bars. 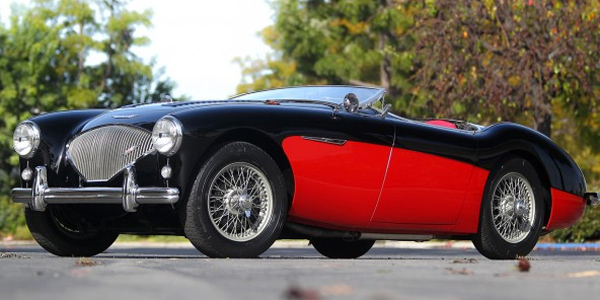 According to its corresponding British Motor Industry Heritage Trust (BMHT) certificate, the original left-hand-drive export model offered here was completed on May 4, 1956, and shipped to San Francisco. In addition to the louvered bonnet characteristic of the 100 M, this car’s factory-fitted equipment included a heater and a laminated windscreen.